repair the background behind it, then re-hair his shaved head. Part 1 covered removing the purple stripe from the eye area using the Cloning tool and doing a quick clean up swipe with the Soften variant of the Retouch tool. Cloning is pretty advanced in that it will take a LOT of your time practicing to master it and you will have to make a bunch of decisions on your own. Here is the story: GrandMOM is coming on Friday for her visit so lets spiffy up the boy, who, by the way is off in college but he wants his grannie to have his "special photo". Luckily GrandMOM doesn't see too well at all even with her specs. Part 2 Part 1: De-Tailing the top pony. Open your PSP image where you finished off from part one or click on the thumbnail on the left to open the full size image to work on. Right click the full size image, save to your harddrive, then in PSP, using the Open Icon on the PSP Tool Bar, browse to and open the file. As before, pick the freehand selection tool, the lasso, from the Tool Palette in PSP. On the Tool Options Palette, which you can toggle on with the "o" key on your keyboard if its not visible, pick EITHER Freehand or Point to Point from the Selection Type drop down box. Set the Feather to 0 and UNcheck antialias to avoid a nasty line around your selection area. Some of you have indicated the Freehand selection option is too difficult to use with a trackball type pointing device. The point to point option will be just as effective. In the image, either click and drag a selection around the top pony tail on the kid, or click and set points around the area with the Point to Point option. With the Point to point tool, right click or double click to set the selection on the image. 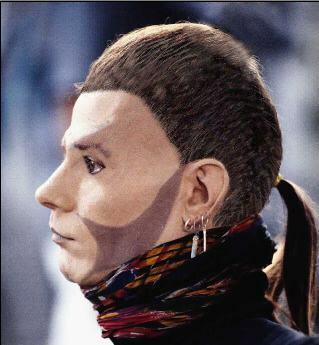 In making the selection, try to follow the curvature of his head and include all the hair in the ponytail in the selection. It's a good idea to save the selection to the alpha channel or to disk for later use. Go to Selections on the Menu Bar and Save to Alpha channel... then on the second dialog box, pick a name like topnotch. For detailed instructions refer to Digital Surgery part one. Next pick the Clone Brush Tool from the Tool Palette. On the Tool Options palette, on the first tab, set the Shape to Round, Size to about 30, Hardness to 0, Opacity to 33, Step to 25, Density to 100 and CHECK Build up box. On the second tab on the Options Palette, pick Aligned from the Clone Mode Box. As before, set the third tab's Cursors to Show Brush Outlines, however, this is up to you. 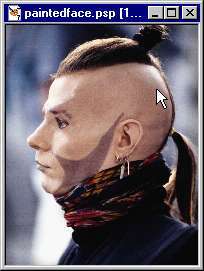 Set the clone source by RIGHT clicking somewhere on the background and clone out the top ponytail. I used some dark blue to start with then added some lighter blue in places. Unlike last time when we wanted to replace all the grain and worried about the highlights, this time just do a average job, trying the blend the colors in from other areas of the background. Just get rid of that Ponytail!!! When you are happy with your clone job, go to Selections > Select None. Using the Freehand Selection Tool or the point to point tool with the same settings as before on the Options palette, make a bigger selection around the clone area, to include more background. Next go to Effects > Blur > Gaussian Blur from the Menu Bar. 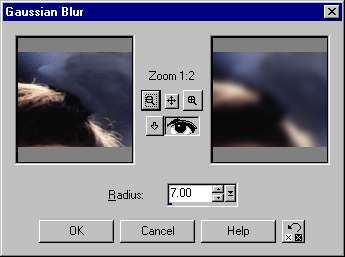 On the Gaussian Blur dialog box, enter about 7 in the box. Notice how the cloned part of the background is more uniform with its surroundings except for the noise factor. On the dialog box, try a value of 10 and click OK.
Now the background looks pretty good. I bet y'all can do a better job than I did! LOL. Do a Selections > Select None from the Menu bar. And that's about that. If you want, on your own, remove the back ponytail in the same fashion! Save the file in its psp format. The chop job Mohawk is not going to cut it with Grannie. Start by taking freehand selection tool, set to either freehand or to point to point on the options palette and select an area to re-hair. On the Option Palette, using pretty much the same settings as before on the first tab, Round, size = 29, hardness = 0 blah blah, check the build up box. On the second tab, set the clone mode to Non-Aligned. Set the clone source by RIGHT clicking on the area of pixels you want to copy FROM, indicated by the red circle on the left. 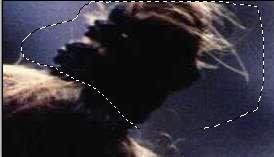 Then start cloning by painting in the selection, indicated by the gray circle. No matter where you go to paint next, the clone source will start at the original location. Use this mode when you want to clone the same pixels over and over into different areas. In our case we want to use areas of the current hair that are headed in approximately the right direction to rebuild the hairline. 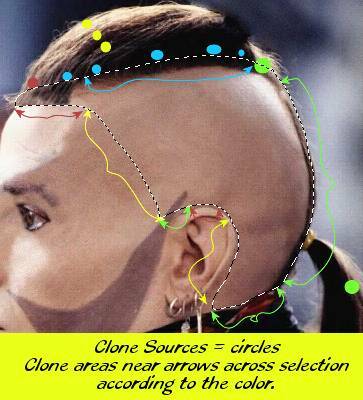 Therefore, pick an area to clone FROM with a new RIGHT click when you are ready to change direction on the hair line. See image on left for pointers. The dot represent the clone source set point and the color coded arrows show where that clone source might work for painting. Redo his head roughly and it might look a bit like this. 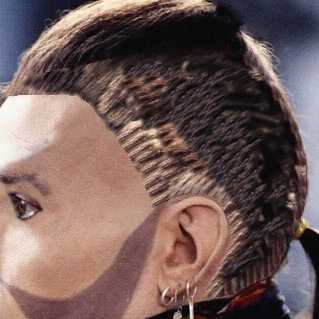 Oh OK... so he got a worse barber! 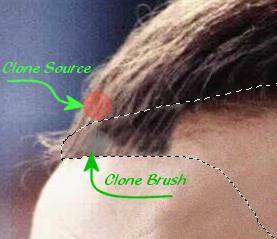 Go on with the cloning brush over the same rough areas, but change the opacity of the brush to say 30 percent and maybe UNcheck build up. A second pass might look like this. I think we have gone about as far as we can with the cloning brush here. Now its time to switch to the Paint Brush and get creative. 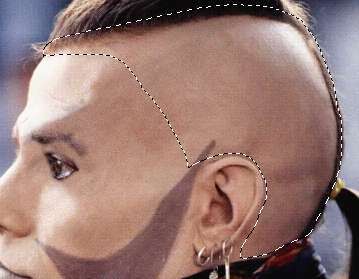 We have a pretty danged hard edge on the hairline so lets change that by modifying the selection. On the Menu Bar, go to Selections > Modify and pick Expand... On the dialog box pick 3 pixels. 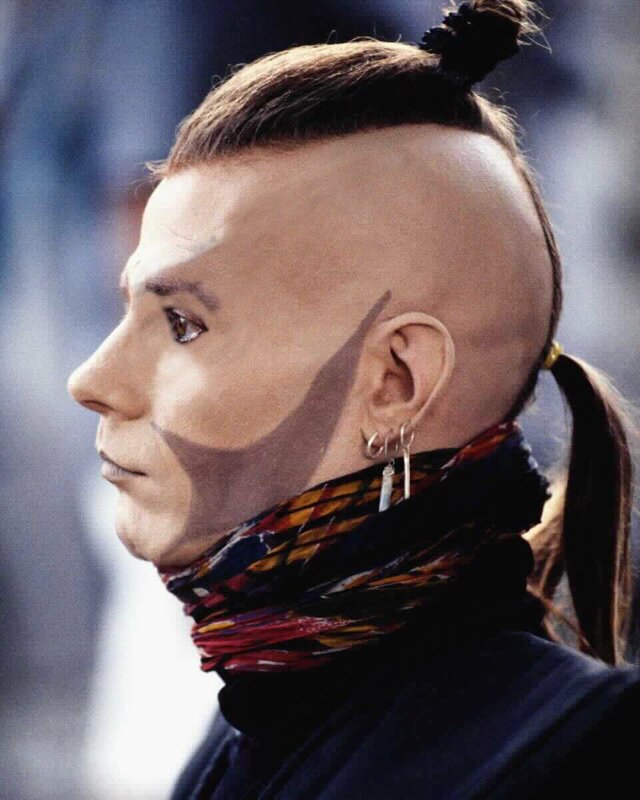 To encourage the edge to blend in better with his face, go to Selection > Modify > Feather and pick 3 pixels. If you use the zoom tool, and zoom into the image notice the selection is just a bit bigger. Pick the Brush Tool from the Tool Palette. For the Foreground color, click the swatch under Styles on the Color palette to pop up the color dialog box. Run the mouse over the image and the cursor will change to an eye dropper. Pick a dark brown, R = 19 G = 10 and Blue = 13 from the hair. Click the Add Custom button to add this color to your custom palette. While here, run go pick up a lighter hair color from the image. I chose R 192, G 157, B 138. Click the Add Custom button again to set the second swatch to the lighter color. Mouse over the image one more time and pick up a very light highlight color from the hair. I chose R 229, G 207, B 184. Click the Add Custom button again to set that third color. Click the first swatch on the Custom Color area, the dark brown, then press OK to close the Color Dialog Box and set the foreground color. Set a texture for the Brush. On the Color Palette click the right facing arrow on the top swatch under Textures. Pick the texture option from the flyout box. On the Tool Options Palette set the brush variables. I started with Shape = Round, Size 13, Hardness 100, Opacity 33 etc. No build up. Repaint the hair, repaint the head... LOL. Note where the selection meets the face that the line is a bit less hard now with the feathered selection. Vary your the size and opacity of the brush to make the hair look as natural as possible. After a pass with just the dark brown it might look like this. 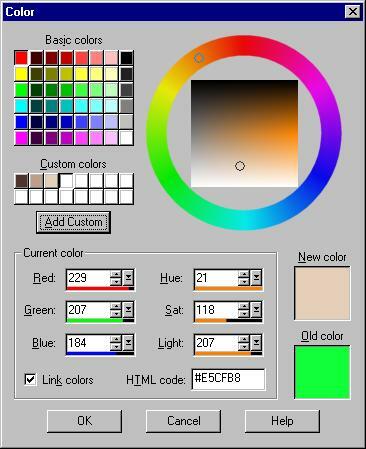 Next pick a lighter color of brown, either the second one on the custom colors area on the color palette, accessed by clicking the foreground color swatch, or by holding the CTRL key with the brush tool still selected changing the cursor to an eyedropper temporarily. Either way, pick a color out of the hair. Change the brush options to a "hair brush" by setting to Shape = Right Slash, size 4, hardness 7, Opacity in the 20's somewhere. 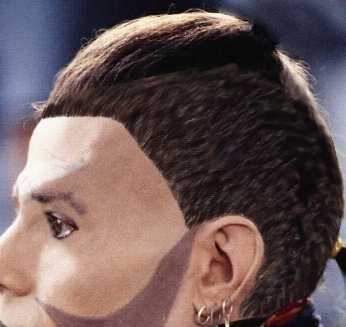 Streak his hair especially around the hair line. A Trick: Set a different color for the background color by clicking the background color swatch and using one of your custom colors or by holding the CTRL Key (eyedropper) and RIGHT clicking a color out of the hair. Now you can paint with either color. Left click drag for foreground color or RIGHT click drag for background color. Set a texture for the background color using the second swatch on the Textures area if you want. Makes painting that much faster. Do your best to fill in the hair. OK, so I ain't the best artista but I think you can get the idea from the image. On the left is another pass using the right slash brush shape and several other colors from the hair. Finish this up by remove the selection with Selections > Select None from the Menu Bar. Blend some of your streaks with the slash brush into his regular hair area, previously outside the selection. 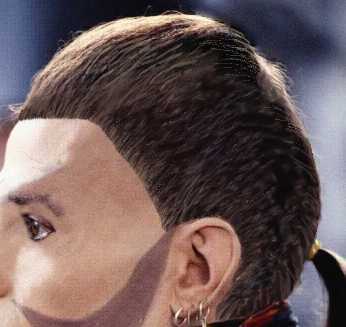 Also use a light color, perhaps even flesh, to jaggedy up his hairline more as. I got out the clone tool one last time, changed the Mode to Aligned and set the Options on the first tab to Shape = Round, Size = 25, hardness = 0, Opacity around 40. No build up. Using a clone source on the face near the hairline, I worked the hairline just a bit more, blending the edges and making it just a bit less regular. 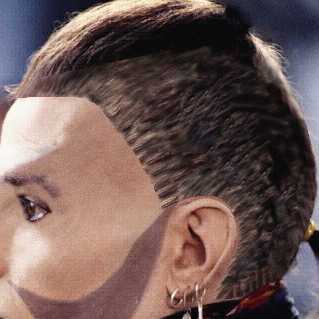 Last thing, if needed, is to add some noise back into the hair or face near the hairline. Put on a selection, and you know how to do that with the freehand selection tool or load one from the alpha channel or disk. 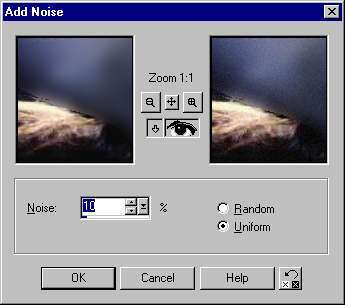 Do an Effects > Noise > Add... from the Menu bar. For better or worse, Grand MOM, here is our kid. Isn't he cute?